The qualifying session for the second race was for the top-seeded drivers. Most of the drivers started the session with fresh tyres. Soheil Ayari (ANAVEO Saleen) waited for a while. 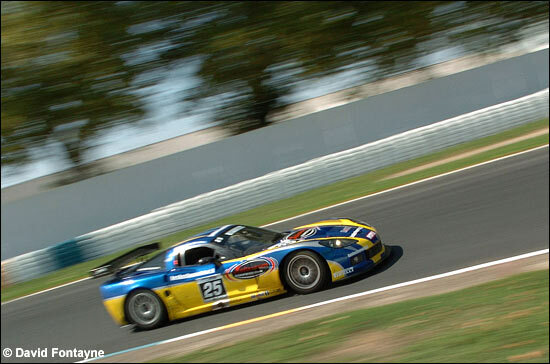 Bouchut (SRT C5-R) was quickest at the start, but he pitted soon, owing to vibrations on his SRT Corvette. Dumez (Viper), then Zangarelli (Mirabeau Viper) and Thévenin (VBM Viper) were fighting hard for the pole, Zangarelli being quickest. With ten minutes left, Ayari started at last, and as soon as his first flying lap, he was on the pole. He then improved on his second lap, to secure the pole position. Lucas Lasserre (#14 Viper) was second quickest, but he had an off and crashed his Viper into the barrier. The car was too badly damaged would not race. 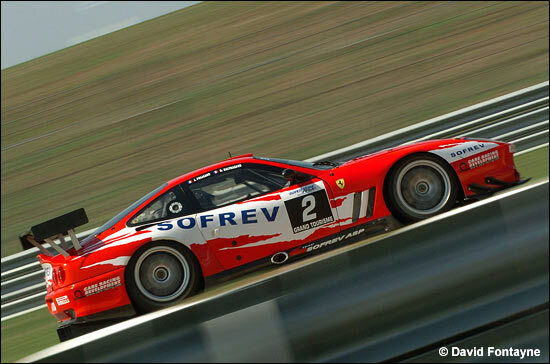 Palttala (PSI C6.R) was eventually second quickest, ahead of Lasserre and Policand (Larbre Ferrari 550). Even before the start of the second race, nine cars had been withdrawn, including Dupuy’s #3 Saleen (Dupuy had been in the hospital for a check-up after his Saturday crash, but was eventually OK), the #4 First Racing Viper, the #10 Mirabeau Viper and the #14 Team Tarrès Viper (Lasserre / Debard). 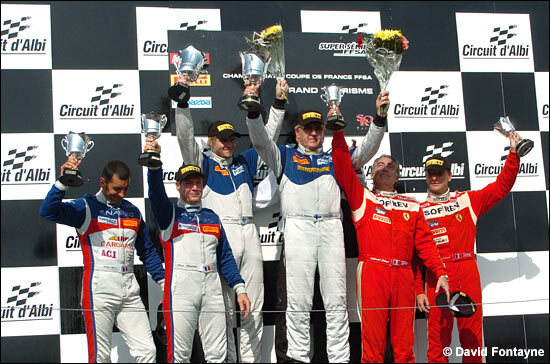 On the first lap, the positions didn’t change : Ayari’s Saleen was ahead of Palttala’s Corvette, Policand’s Ferrari and the Zangarelli, Thévenin and Dumez Vipers. Ayari (#9 Saleen) and Palttala (#25 Corvette) were neck and neck and widened a gap upon their potential challengers. Bouchut (#27 SRT C5-R) was quickly moving through the field after he had started from the seventh row. In the traffic, Palttala succeeded in passing Ayari. Policand (#2 Larbre Ferrari 550) was now a lonely third whereas Zangarelli (#12 Mirabeau Viper), Thévenin (#1 VBM Viper) and Dumez (#11 Euroflash Autovitesse Viper) were already threatened by Bouchut who soon passed them one by one and was running now in fourth place, chasing Policand. Palttala had a five second lead over Ayari after 20 minutes, then it was a ten second lead. Thévenin and Zangarelli pitted first for the driver changes. Two laps later, all the other drivers pitted too. After the driver changes Kuismanen (#25 Corvette) was in the lead ahead of Hernandez (Saleen) and Balthazard #3 Ferrari), who was soon overtaken by Lebon (#27 SRT Corvette C5-R). Hernandez was pushing hard and was in Kuismanen’s exhaust fumes, while Bornhauser (#1 VBM Viper), Soave (#26 SRT C5-R) and Blanchemain (#11 Euroflash Autovutesse Viper) was fighting hard. Hernandez attacked unceasingly, but couldn’t pass, so the #25 PSI Corvette had its second win of the weekend, ahead of Hernandez / Ayari (ANAVEO ORECA Saleen S7R) and Balthazard / Policand (SOFREV Larbre Ferrari 550). Lebon was in third place on the finish lap after a risky move on Lebon’s Corvette, but he had a penalty owing to this avoidable contact and was eventually eleventh in the race results. 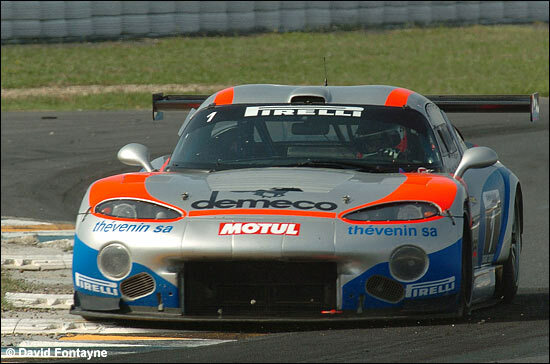 In the late stages, Blanchemain overtook Bornhauser (below) for fourth place, Soave / Cayrolle’s SRT C5-R being in sixth place. With thanks to Frédéric Espinos and Olivier Loisy, with images by David Fontayne.